Pet Feeder. It then automatically closes when the cat moves away, preventing all other animals and children gaining access to their food. 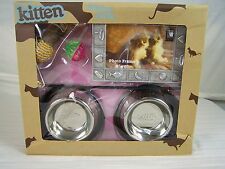 1 x Microchip Pet Feeder. Feeder opening-Size of the area that your pet will eat from 8 1/4" (W) x 6 1/8" (H). NICE "FISH BONE SHAPE RED PLACE-MAT PET CAT FOOD FOAM MAT”. Material: foam (like yoga mat material). Color: red & white. Easy to clean. Man’s best friend can be your floor’s worst enemy. Now there’s a solution with the Drymate Pet Bowl Place Mat. Made from over 50% recycled fiber and proudly made in the USA. This custom personalized cat food place mat is the perfect unique gift for your kitty. Place mat is made of oak cork. Food bowls pictured are not included . Wet Noz Flexi Duo Bowl. Combines stainless steel eating with integrated silicone mat to provide no-slip eating with easy-clean spills! Removable stainless steel bowls in smooth to touch silicone mats. PLACEMAT, BALL WITH BELL, FEATHER. INCLUDES: FOOD AND WATER BOWL. Drymate brings you the perfect Pet Place Mat for you. This Mat is 20" x 12" and will perfectly fit in any place in your house and hold any cat litter bin., or even water and food dishes for your pet. Ultra thin soft stain resistant felt-like non woven material is coated on one side with a non-slip durable special bonded backing that prevents "soak-thru" from above and below. Color: Zebra. Best Price. Publisher: Drymate. Label: Drymate. Color: Pink. Best Price. Our goal is to save YOU money and put it right back into your pocket. Weight: 0.3 lbs. Smooth silicone mat fits underneath the stand. All pieces are dishwasher safe, including the mat. Weight: 2.75lb. Rolls up for easy storage. ULTRA-ABSORBENT AND DURABLE: This food mat absorbs any water slop, splash, food stain or spill, protects your carpets and hardwoods; the non-slip back surface prevent it from sliding across smooth surfaces. We understand that your pets are part of the family and have developed products that both you and them with enjoy. ULTRA-ABSORBENT AND DURABLE: This food mat absorbs any water slop, splash, food stain or spill, protects your carpets and hardwoods; the non-slip back surface prevent it from sliding across smooth surfaces. Drymate Pet Bowl Place Mat in Furtitude. We would love to be given the opportunity to work with you to resolve any problem you may have. Need your item quicker?. We would love to be given the opportunity to work with you to resolve any problem you may have. Do you need your item quicker than that?. Drymate Pet Bowl Place Mat in Furtitude. Easy to clean and is machine washable. Bone Dry DII Small Microfiber Pet Mat for Food, Water, Treats, Ultra-Absorbent & Machine Washable Food Mat for Dogs and Cats. Pick it up and whisk it away to the laundry room, wash in cold water, tumble dry; do not use bleach or fabric softener. Drymate Pet Bowl Place Mat in Furtitude. We would love to be given the opportunity to work with you to resolve any problem you may have. Need your item quicker?. Easy to clean and is machine washable. Suitable for pet feeding and watering. Function: Pet Feeding & Watering Mat. 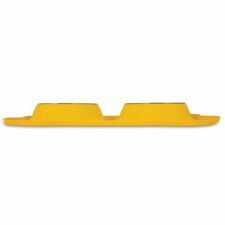 Mat with dish edge design can prevent food and liquid onside spilling, which can keep floor dry. Type: Pet Place Mat. 1 x Pet Place Mat. With size of 18"x10", fits two puppy dogs or cats food or water feeding together;. - Pet placemat, food feeding mat, pet floor rug, trainning pad, catcher mat, keep pets clean and health;. - Flexible, made of non-skid PVC, rubber bottom;. Pet placemat, food feeding mat, pet floor rug, trainning pad, catcher mat, keep pets clean and health;. 1 Piece Pet Placemat. - With size of 18"x10", fits two puppy dogs or cats food or water feeding together;. 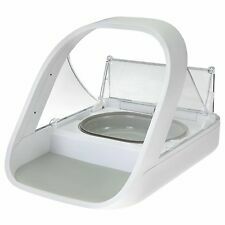 With size of 18"x10", fits two puppy dogs or cats food or water feeding together;. - Pet placemat, food feeding mat, pet floor rug, trainning pad, catcher mat, keep pets clean and health;. - Size: Approx. Size: Approx. - Pet placemat, food feeding mat, pet floor rug, trainning pad, catcher mat, keep pets clean and health;. 1 Piece Pet Placemat. - With size of 18"x10", fits two puppy dogs or cats food or water feeding together;. Non slip mat. Ideal for dog and cat bowls. We are here to help! 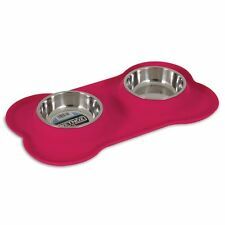 Ideal for placing underneath pet food and water bowls My Princess place mat. Non-slip mat. We are here to help! Thick mat. Non slip mat. Ideal for dog and cat bowls. We are here to help! Keep your floor clean. Available in grey colour These loop feeding mats are great for trapping food and water that has been spilled by your pet. The mats can be machine washed for improved hygiene. Available in grey colour.